Climate change is occurring rapidly in the Arctic, bringing new economic opportunities alongside challenges for environmental governance in the region. The Arctic region not only plays an important role in regulating the world's climate, but is also highly affected by climate change. A new book edited by Ecologic Institute's Elizabeth Tedsen, Sandra Cavalieri, and R. Andreas Kraemer addresses the significant changes and developments the Arctic has undergone in the recent years. "Arctic Marine Governance: Opportunities for Transatlantic Cooperation" looks at the current governance environment in the marine Arctic, considers how policy frameworks can adapt to address new challenges in the region, and examines opportunities for cooperation between the European Union and the United States. 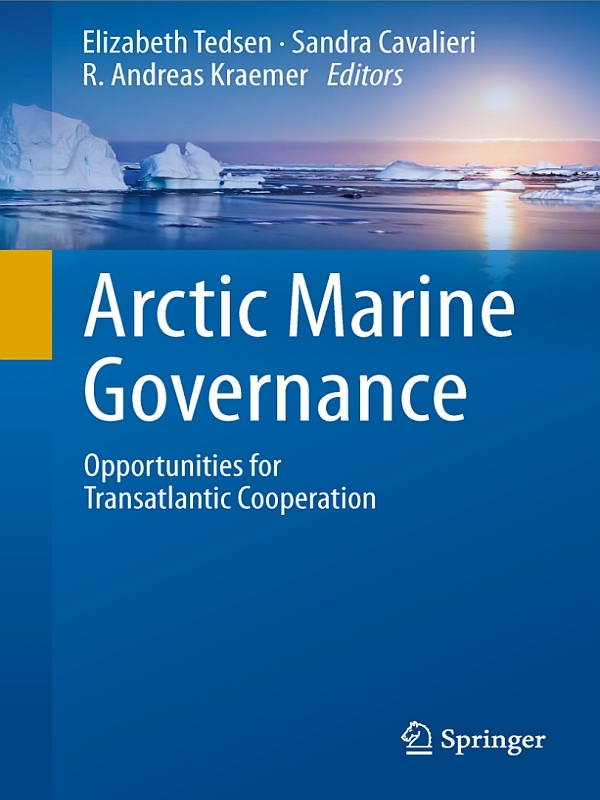 The book draws on the results of the 2008-2009 Arctic TRANSFORM project, funded by the European Commission‘s Directorate General of External Relations, which engaged experts in a transatlantic discussion on the roles of the EU and US in light of the Arctic’s changing climate and political and legal complexities. Divided into four parts, the book begins with an introduction to the Arctic’s physical and policy environments. An introductory chapter describes the spatial scope of the marine Arctic, the roles played by the law of the sea and the Arctic Council, and Arctic and marine policies of the EU and US. Next, Ecologic Institute's Arne Riedel provides an overview over of the unique Arctic environment and of threats to it, particularly from climate change. Chapter 3, written by Ecologic Institute’s Susanah Stoessel, Elizabeth Tedsen, Sandra Cavalieri, and Arne Riedel, assesses regional and international environmental governance (formal and informal) in the Arctic. A fourth chapter looks at the impacts of climate change on Arctic indigenous peoples. The book’s second part explores impacts and activities by sector, looking at fisheries, shipping, and offshore hydrocarbon exploitation in the marine Arctic. Chapters explore the various changes and challenges brought about by climate change for each of these areas. Existing international and national policy frameworks and legal gaps are analyzed, along with policy options for improving governance and reducing environmental risks. The third section of the book considers ways to improve marine governance in the Arctic through policy processes and outputs such as environmental impact assessments, marine spatial planning, and marine protected areas. Integrated assessments of ecosystems and activities, spatial planning processes, and protection of vulnerable areas can help mitigate changes and protect the Arctic environment. Chapters consider how these tools can be applied through a variety of legal and policy frameworks. Finally, the book concludes with a chapter by Sandra Cavalieri and Elizabeth Tedsen summarizing recommendations for EU-US cooperation in the Arctic region. The EU and US share many objectives and interests in the marine Arctic, providing common ground for cooperative transatlantic action in areas such as promoting integrated, ecosystem-based management, supporting the inclusion of indigenous peoples in decision-making, and tackling the biggest underlying problem of Arctic governance: climate change. The book can be purchased online at the price of 106,99 Euro for the hardcover version and 82,29 Euro for the eBook version. Additionally, each individual chapter can be purchased at the price of 29,69 Euro. Tedsen, Elizabeth, Sandra Cavalieri, and R. Andreas Kraemer (eds.) 2014: Arctic Marine Governance. Opportunities for Transatlantic Cooperation. Heidelberg: Springer.